Marketing Information: Cuisinart presents a countertop oven that's the ultimate combination of size, style and smarts. The big, 1.2 cubic foot Microwave Convection Oven and Grill looks like it belongs in a high-end commercial kitchen. Brushed stainless steel and black frame a sleek control panel that offers single and combination settings for an unlimited number of cooking options. A multi-stage cooking feature that automatically shifts from one function to another makes perfect results easier than ever. 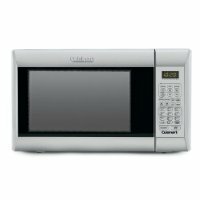 This is a new generation of microwave - and it's from Cuisinart, of course!